Data entered from the pos or back office is automatically available immediately to the rest of the system. This means for example that when you are making claims against suppliers, the system knows all the products purchased from that supplier and the purchase invoice details. 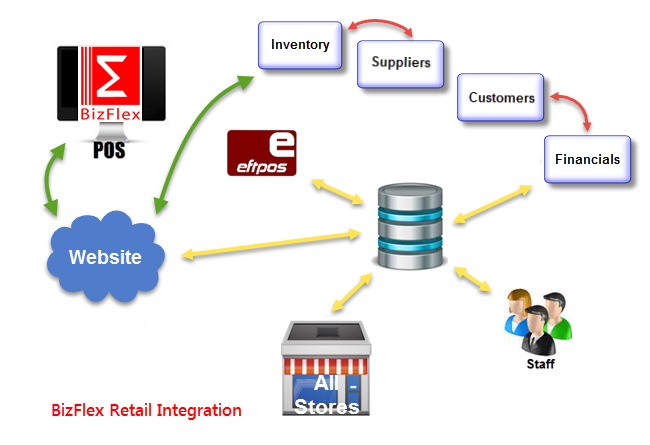 BizFlex provides automatic and seamless integration for all your products, directly into your website. You simply mark which products you wish to publish on the website in the BizFlex Product Master and BizFlex does the rest. New or changed data at any location at any time is automatically synchronised via secure Internet to any number of other sites and/or Cloud. Multiple copies of your database can be maintained at different locations. Your vital business information is up to date 24 x 7 with online access from anywhere a computer or notepad can connect to a network.